Welcome to the Tarot Professionals Blog Hop! Their intention is to host a monthly blog hop that is an exclusive forum for their members to share their tarot and cartomantic blogs and build community through writing on a common theme or prompt. The hop organizer, Fiona Benjamin of Modern Fortune Teller, has given us a seasonal topic for February: Using tarot for better relationships. Considering that the topic of romantic relationships is one of the most common questions from clients, you should find a lot of useful info from the posts in this hop! 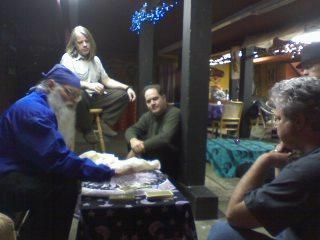 John the Tarot Wizard laying out a spread while John A, Jordan, Scorpio, and John L. look on. Denver Tarot Meetup, January 18, 2009, at Gypsy House Cafe. These five topics were explored with some hands-on examples. I was particularly taken with the “Celtic Crossroads” spread. John showed us how to do a couples reading using two decks. The basic concept was simple, but innovative. When two people came for a reading, whether a romantic couple, friends, or family, he would give a deck to each of them and have them shuffle. Then he would lay out a spread (in the example he used the Celtic Cross) using one deck, then lay the spread out a second time, with the cards from the second deck layered on top of those of the first. It not only provided two separate readings, each geared towards each partner, but also produced a fascinating array of relationships as the layers of cards could be read together. I have used this technique many times for couples readings. One time I even had a chance to do the spread for three people in a polyamorous relationship, using three decks. It was fascinating to immediately pinpoint the role each person played and how well they worked together and supported each other. I don’t usually use the Celtic Cross, but luckily this technique works great with any spread. When choosing whether to use two decks for one reading for a couple, or whether to read for each separately, I ask each person involved what their question is. If the questions are related or naturally depend on or play off each other, then I do the two deck couples reading. Otherwise, I just give each person their own time for their own questions. For instance, let’s say a young couple wants to start a family. If one wants to know what would be the outcome of staying home with the baby and the other wants to know about career opportunities, those questions can both directly reflect the topic, so I’d do the two deck spread. However, if in another situation one is very set on moving to another state for career advancement and the other is very determined to stay in Denver for family reasons, I might just give them each their own time and own spread because the questions and motivations are so different. I think in many ways the couples reading would work for almost any situation, but I tend to use it only when the questions feel very related and naturally intertwined. When reading a multiple deck gridform like this, take particular note of the relationships between the different decks. Like any reading, note preponderances and other patterns, but note them within each partner’s individual spread as well as comparing the two. You might find that majors or the same suit will show up for both partners in the same position, or alternately, it will be clear from very different cards how one partner will be more affected by something than the other. Getting the same card for each partner in the same position can be telling, but also if some of the same cards come up for each, but in different positions, that can also help you find themes for the reading. On rare occasions I’ve only had one deck with me and needed to do a couples reading. Under these circumstances, I cut the deck and gave half to each person to shuffle. Then I laid out the first spread for the first person with half the deck, and repeated the spread for the partner with the second half of the deck. There won’t be repeated cards that way, and you might need to be a little more careful about noting which cards belong to which partner, but it still works! Here’s a sample spread I laid out for my cats. I asked a general question of what do I need to know about them right now. Each cat had a Major Arcana in the center position. The Sun card over top of the Wheel of Fortune made me think of the changing seasons. FK’s 5 of Swords seemed like him battling the other cats in the neighborhood. For FK, he feels trapped inside the house all the time (8 Swords) and although he’s OK while the weather is like this, when the seasons change (Wheel) he’ll want to go out (also the Wheel, indicating in and out). He likes to fight the other cats in the neighborhood and needs to protect his territory (5 of Swords). For Samhain, he’s fine with just a single opponent (FK of course) to spar with (Ace of Swords). He feels like he’s in his natural domain in the house (Sun (R)). He’s content lounging around (9 Cups). Now reading them together, FK feels trapped under the authority of his big brother (Ace of Swords over 8 of Swords). Because Samhain is older and has lived with me longer, he is the top cat, and FK wants to overthrow the regime (Wheel underlying the Sun). FK would rather fight than live a life of content acquiescence (5 of Swords and 9 of Cups). Samhain is very focused on helping others–he thinks he can cut the Fuzzy Kitten’s bonds (Ace Swords and 8 of Swords). He is not about who’s in charge, he thinks the two of them can be partners (two people holding hands in Sun card vs. the overthrow of the regime seen in the Wheel). Samhain says, sheathe your claws (5 of Swords) and have a drink of this fun bubbly stuff (9 of Cups), there’s plenty! I hope you like this partner spread for my cats! Enjoy the rest of the blogs on the hop! This is great, Joy! I now have a reason to keep multiples of some decks laying around. Hey there; I didn’t see any way to contact you directly, so I decided to leave this comment here. I was trying to add your blog to my RSS feeder, but it’s not going. I don’t know if the problem is my feed reader or if it’s something to do with your blog, so for what it’s worth you should confirm if the RSS feed is working. Ask a friend to try and load it on their readers, or try one of your own – whatever you try, I’m just letting you know that it doesn’t appear to be working in case you want to try and fix it. Happy blogging! Hmmm. That’s a stumper. I was able to add this blog to my RSS feed without a problem (just did it now, I hadn’t actually had my own blog on my feed before!). Also, there’s a “Follow this blog via email” sign-up on the right, at the bottom of all the sidebar menus–that works by RSS feed and I have been subscribed myself to that since I installed it years ago and I always get the emails when there’s a post. Maybe try that. If you want to add the feed manually to your RSS service, it’s “http://joyvernon.com/Blog/feed/”. Thank you for reading! YES – great suggestion to have each member of the relationship use a different deck! I LOVE that. Why didn’t I remember to do that? this post also has me thinking this would be a GREAT way to divide up the deck (as you suggested) using the Transparent Tarot and then layer them on top of one another – Brilliant! Thank you!